Happy, Happy Monday to you!! Can you believe that in only 3 short days it will be 2015?? Is that CRAZY or what! LOL!! Today I am sharing a fun little tag I created using one of Tara's newest releases "Tag It". The stamps come with an SVG cut file for the tag shape, then you stamp the border on it... LOVE these so much!! For the sentiment, I used one of my "GO-TO" stamp sets "Happy Celebrations". I wish you all a very Happy, Healthy and Prosperous NEW YEAR!! Great tag! 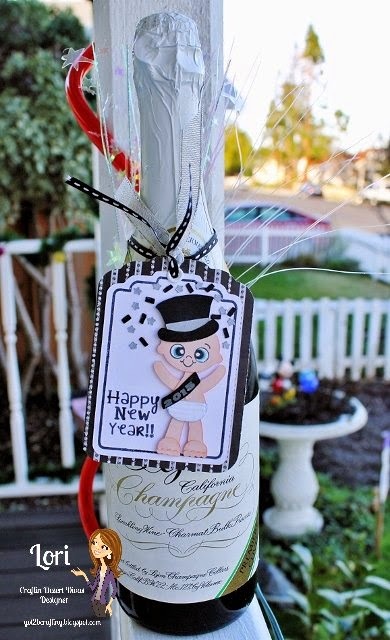 Love the paper, sentiment and that baby new year! Oh my gosh this is the cutest! I literally squeaked when I saw it on instagram yesterday! Adorable!